This is the week that changed the world. There is a pitter-patter of excitement in my heart this morning as I think about our Church Easter Cantata this past Sunday. Watching the drama act out portions of the events leading to the crucifixion… hearing the cries of the drama team as Jesus and the Roman soldiers made their way up the isle of the church… hearing the thud… thud… thud… of the hammer hitting the nails; and then trying to sing afterwards with tears streaming down my face. And then… that moment that changed the world! Oh glory!!! We began singing slowly “Low in the grave He lay, Jesus my Savior…” and then gradually the music crescendos, the tempo increases and then with a “ca-pow ca-chow” (in the words of my grandsons) in the music, a light comes on in the tomb and Jesus steps forth and a flood of emotion rushes through my veins. If this group of amateur drama team members can make my heart stop like that, just imagine what it must have been like on that day! The words of the psalmist soothe my soul this morning… “But the Lord shall endure for ever” – Psalm 9:7a. His goodness – regardless of circumstance. Psalm 52:1 – Why boastest thou thyself in mischief, O mighty man? the goodness of God endureth continually. His Name – regardless of how many times the world tries to silence it. Psalm 72:17 – His name shall endure for ever: his name shall be continued as long as the sun: and men shall be blessed in him: all nations shall call him blessed. His seed – The children of Israel and we who have been grafted in by the blood shed that day on Calvary! That’s us! Psalm 89:29 – His seed also will I make to endure for ever, and his throne as the days of heaven. Psalm 100:5 – For the Lord is good; his mercy is everlasting; and his truth endureth to all generations. Just a few of the many things that will endure because of that week that changed the world! I hope you know my Lord today! If you don’t… it’s time you do, because you too will endure forever in Heaven, or in Hell. Don’t delay. 1. Admit you have sinned – we all have. Romans 3:23 – For all have sinned and come short of the glory of God. 2. Understand that sin has a debt that must be paid, and believe that Christ paid it for you. 3. Confess, meaning to openly and unashamedly agree that the Christ died for you, so that you could endure through hard times and have eternal life with Him. Romans 10:9-10 – That if thou shalt confess with thy mouth the Lord Jesus, and shalt believe in thine heart that God hath raised him from the dead, thou shalt be saved. For with the heart man believeth unto righteousness; and with the mouth confession is made unto salvation. If you made a decision today to trust Christ as your Savior, please comment below or private message me at talk2shari@gmail.com! I’d love to encourage you in your journey. 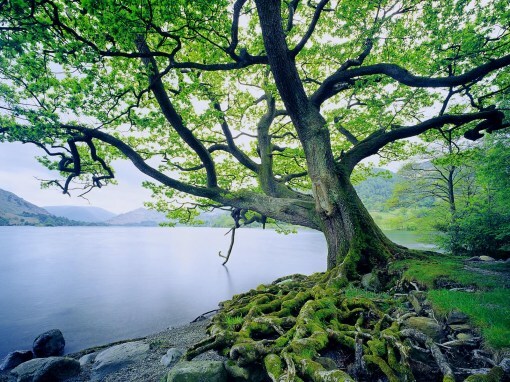 Are You Rooted by the Water? Jeremiah 17:7-8 ~ Blessed is the man that trusteth in the Lord, and whose hope the Lord is. For he shall be as a tree planted by the waters, and that spreadeth out her roots by the river, and shall not see when heat cometh, but her leaf shall be green; and shall not be careful in the year of drought, neither shall cease from yielding fruit. A tree planted by the water doesn’t thirst as does the tree planted in barren soil far from the river bank. Neither does a Christian firmly grounded in the Word of God, as opposed to a Christian who’s a hit and miss on Bible reading and church attendance. But I’ve also seen church folk who arrive every Sunday, looking as parched when they left as they did when they arrived. I was watching a large church service online yesterday; a young Pastor just filled to brim with excitement for the Lord’s work, the house was packed and those that the camera zoomed in on were obviously enjoying their time in the house of the Lord; but what about those that the camera men knew better than to zoom in on? Those prune faced, arms crossed, less than enthusiastic parishioners who showed up at the well, but refused to drink. What about them? Something has to be wrong with the root system. I loved what Jeremiah says in these verses. The life of a child of God should bear witness to these verses. Why then do I see so many who claim to know Christ facing the day as if all hope was gone? It is just a theory, but I’d venture a guess they’re not close enough to the water. Jeremiah said the tree planted by the water would not see the heat coming. He did not say there wasn’t any heat, but the tree wouldn’t see it. Tell me you don’t know what it’s like to have the heat turned up in your life. You know it. But what this verse tells me is Satan can turn the heat up all he wants; but if I’m truly trusting in the Lord, I won’t see it. Jeremiah says the “leaf shall be green.” A green leaf has juices flowing through it, it’s flexible, the winds can blow but it stays firmly attached to branch. Hello!!! Does that put a shout on me this morning! A saint of God who is trusting in the Lord is alive! The water of life flows through their veins and their excited about what the Lord is doing in their life. Their flexible if things don’t go the way they thought the would, and when the winds get fierce their wavin’ glory! There He was; the Lord Himself preaching His heart out and some would hear, and some would not. How daunting it must be for the preachers when they preach the Word realizing that if they ignored Christ, how will their message ever get through? It s for certain that the world has partial hearing loss when it comes to Spiritual things. The Word of God convicts the soul, you’ll either change or turn it off; because if you continue to listen you will not continue to stay in your sin. I think there are at least three reasons we lose our Spiritual hearing. I detest talking to someone when the television is on. I’m either listening to them or the show or bits of both and only half catching either. It ends up being a mass of confusion. Listening to the Holy Spirit can be much the same if we refuse to turn off the world around us. You can hear one or the other clearly, but bits of both leads to confusion. Listen to something loud enough and long enough can cause at least temporary hearing loss, and so it goes spiritually. If you constantly listen to worldly music and entertainment, if you read magazines instead of the Bible, if you stay at home and watch the race instead of going to church, the noise drowns out the Holy Spirit. God will take second place to nothing, and why should He? When the world speaks contrary to the scripture regarding lifestyle choices and behaviors you cannot partially hear and entirely obey. We cannot pick and choose from the scripture what is right for us and omit what doesn’t fit into our lives. Amen? God is 100% correct. The longer you read the scripture, the more prophesy you see coming to life right before our very eyes, the more you realize the end of the book is nearing. Just because you don’t like, doesn’t make it null. And believe me when I say there is always effect for failing to obey the Word of God. ~ I’ve gotten that tee shirt. Natural causes – The gradual loss of sensitivity to hearing. It almost goes unnoticed; until one day you realize you’ve missed half of what someone says. It’s often embarrassing for the listener, so rather than confessing it they just go on, pretending all is well. The world has desensitized themselves to hearing God. When the Holy Spirit moves on them to testify or do something out of character they refuse to leave their comfort zone. And eventually their closed off the Spirit completely. He could be sitting right beside them in a literal form and they wouldn’t notice. There is a true story of twin girls who were molested by their father and one chooses to forgive and the other chooses to forgo forgiveness. Guess which one lived the happier life? Not to make light of the situation, because no one should ever violate a person in that way. But the twin who refused to forgive relived the circumstance every day, and the twin who forgave moved on to the newness of life that the forgiveness of Christ affords. Traumatic circumstances like this can cause a person to turn God off. And it’s a wonderful tool of Satan to help them with the volume button. If you’ve been hurt, get your Bible and turn the volume up as loud as you can to drown out what Satan is telling you. Because in those pages are healing. God to a good Bible preaching church, because in the Pastor’s anointed words are healing. Hearing brings healing. There’s a reason you may walk by car and hear a loud mouthed preacher shoutin’ to the top of his lungs. I’m drowning out the world. You may see me at a the restaurant table reading my bible rather than having lunch with someone, I’m drowning out the world. And its not that my life has been perfect, its just that I’ve chose to listen to God because I’ve experienced the peace He offers. And so can you. Exodus 12:25~ And it shall come to pass, when ye be come to the land which the Lord will give you, according as he hath promised, that ye shall keep this service. Genesis 12:1-3 Now the Lord had said unto Abram, Get thee out of thy country, and from thy kindred, and from thy father’s house, unto a land that I will shew thee: And I will make of thee a great nation, and I will bless thee, and make thy name great; and thou shalt be a blessing:And I will bless them that bless thee, and curse him that curseth thee: and in thee shall all families of the earth be blessed. For four hundred and thirty years the Israelites had been enslaved to the Egyptians. I have to wonder how many times they ask the Lord, “But what about the promise?” How many generations died without having seen it? God’s timing is not ours (else my last journey through heartache would have been much shorter!) Abraham, the original receiver of the promised died having not seen the promise fulfilled. Even with Abraham’s death, Israel’s disobedience, and a change in priorities of God’s people, God didn’t change the promise. He promised Abraham he would make of him a great nation and as the 600,000 men, likely over one million people trekked across the dry land of the Red Sea, what a sight it would have been to behold. My heart stirs in me this morning at the thought of what it must have been like to have been in that passel of people! It stirs not only from that promise being fulfilled but from the promises fulfilled in my own life on the countless times God has said “I’ll bring you through” and He did! When God said move, they needed to go – If the children had stayed in the corrupt world of Egypt, God’s plan would not have been fulfilled, they needed to go to the Promised Land where the influence of the world would not be. The problem with that was, they took a lot of the influence with them in their minds. They left the country behind, but not the characteristics. And because of that they lived defeated many times. But the promise didn’t change. It just wasn’t as good as it could have been. I hope today find you clingin’ to the promise! It did not change! Lamentation 3:22 It is of the Lord’s mercies that we are not consumed, because his compassions fail not. 23 They are new every morning: great is thy faithfulness. Jeremiah the weeping prophet spent a lot of time in frustration with the condition of his nation. Called by God to be the bearer of bad news but encouraged throughout that God would take care of them. That’s kind of how I feel at this time in my life. I am frustrated with the condition of America, but I’ve not given up hope! God is a merciful God, His patience may be running thin with us… or maybe not; remember God knows the end of the book! In our walk with Christ we’ll have days on the mountain, in the valley and somewhere in between. Days we fail God, days we’re failed by other people, but GREAT IS THE LORD’S FAITHFULNESS!!! He has never failed us; not once. Short devo this morning because I’m short on time. But I wanted to encourage you that if you’re in the battle, Carry on Friend, it’s a new day. Christainity: I Pray it Goes Viral! Christianity. You’d think it was almost the bubonic plague. No one wants to be around it, they avoid the house where in it dwells, nausea comes on quickly and Heaven forbid a child is exposed to it, whatever will become of them?! It would be funny if it weren’t so true. And so many dead Christians have been seen walking about, it’s no wonder communities have great fear in their hearts! So what exactly are the symptoms of a live Christian? And wouldn’t it be wonderful if it went viral! Deep down in the pits of our soul is a desire to know God. I remember as a child being aware of my need to know God. I did not understand it, but there was a thirst that I needed to know the Creator. As time went on God continued to call, but I kept drowning it out with the world. But the thirst to know was always there. When I got saved, my how that thirst increased! When I realized that God’s Son had paid the ultimate price for my sin, and that I no longer needed to fear death, hell and the grave! Oh glory I needed to “Who” He was. I read His word at every opportunity, I sat with His people and I attended His church. I thirsted! 15 The woman saith unto him, Sir, give me this water, that I thirst not, neither come hither to draw.16 Jesus saith unto her, Go, call thy husband, and come hither.17 The woman answered and said, I have no husband. Jesus said unto her, Thou hast well said, I have no husband:18 For thou hast had five husbands; and he whom thou now hast is not thy husband: in that saidst thou truly.19 The woman saith unto him, Sir, I perceive that thou art a prophet. She knew that Jesus was spot on with her sins, and something needed to change. When I accepted what Christ did for me I was so thankful, and so very aware that things in my life, the traditions I had set for my children and I needed to change. One of the major changes in my life was church attendance. 20 Our fathers worshipped in this mountain; and ye say, that in Jerusalem is the place where men ought to worship.21 Jesus saith unto her, Woman, believe me, the hour cometh, when ye shall neither in this mountain, nor yet at Jerusalem, worship the Father.22 Ye worship ye know not what: we know what we worship: for salvation is of the Jews.23 But the hour cometh, and now is, when the true worshippers shall worship the Father in spirit and in truth: for the Father seeketh such to worship him. The woman at the well knew that this was an important part of faith. But she had worshipped whatever came her way. There comes a time when you have to set yourself apart for the apostasy of the world and worship the true and living God, and that calls for a commitment to what exactly it is that you believe. If you’re only there when it “fits in” to your schedule, that’s not commitment. 24 God is a Spirit: and they that worship him must worship him in spirit and in truth.25 The woman saith unto him, I know that Messias cometh, which is called Christ: when he is come, he will tell us all things.26 Jesus saith unto her, I that speak unto thee am he.27 And upon this came his disciples, and marvelled that he talked with the woman: yet no man said, What seekest thou? or, Why talkest thou with her?28 The woman then left her waterpot, and went her way into the city, and saith to the men,29 Come, see a man, which told me all things that ever I did: is not this the Christ? When she discovered Who it was she spoke too, she couldn’t stop talking about Him to everyone she knew. It went viral. 30 Then they went out of the city, and came unto him. Let it be so in our lives! Catch it! This may or may not turn into a series, but the teacher of our family life class at church intrigued me yesterday on a study that they’re working on which is the “Topics of Conversation in Witnessing.” If you’ve ever gone soul winning you’ve likely encountered some topics of conversation that made you wish you were anywhere but there. If you’re new to soul winning (or sometimes old) it’s hard to get that conversation going and even harder to keep it on track; because the last thing many want to discuss is where they stand spiritually. Most would rather point out where the Christians they know fall short. The class came up with about 14 topics they’d like to address and I would say there are countless others. But today I’ll only discuss one. If you have one you’d like to address, put it in the comments below and let’s get a conversation started! I recently lead a devotion at a ladies meeting where I gave each of the ladies a shiny red square sticker for their bible. The sticker reminds us of what God see’s when He looks at us and what we should see when looking at someone else’s sin; that Christ’s blood covered them all. I didn’t say it would be easy. Sometimes I’m tempted to take that sticker off and put it over my mouth to keep it shut! Forgiveness is the greatest gift you can give or receive; comes with the highest price; and is considered the least. It’s easier to jump on the bandwagon and run someone through the mud than forgive and lift them up to the Lord. And that’s from a Christian standpoint. Now put it into the context of witnessing to an unsaved person who’s been hurt by family, friends or a Christian; sometimes quite severe. How can they begin to understand the unconditional forgiveness of Christ when they themselves are so angry and how can you explain it? I love the life of King David; because it is full of success and failure, transgression and forgiveness, and most of all humility. None better illustrated than of the tale of Nathan the prophet who came to David after his sin with Bathsheba. Boy oh boy was David angry…until he discovered it was a parable of him taking Uriah’s wife. That’ll humble a fella. And so goes our own story. There was another lamb, that was slain; the Son of God. Slain to restore the broken relationship between God and man. The one thing that God wanted more than anything was us. And we’ve hurt Him again and again, and He has forgiven us again and again. If anyone can understand how hard it is to forgive, it’s God. Nothing that has been done to us in our lives can even compare with what was done to His Son so that we could have forgiveness. Helping a lost person understand that may not be easy, but it will always be worth it. Forgiveness is unlocking the cell you put yourself in. Can I get an Amen! The wait ~ It will be worth it All! They are the stories we never grow tired of hearing. The stories of deliverance and victory out of a time of trouble. I’ve hesitated sharing my latest story. But I fear that if I don’t tell it, I’ll be denying God the glory and a friend in the faith will be denied hope that their struggle will be worth the wait. My struggle began almost a year ago when facing an uncertain future and unemployment I let faith in God over power what Satan would have loved to have been defeat. I began looking for the plan; I knew God had one. I will not tell you there were not some dark days, but they were few; and not of anything of my own accord. I began that journey in gratitude that God had delivered me first out of terrible place. Unemployment for a year was another hard spot, but I fully believed and trusted in God that it was a part of the plan. Education has never come easy for me. I’m not a “structured thinking” kind of gal. Lectures won’t cut it, and reading had better be interesting! I need hands on life lessons and in April of 2012 I was about to get a year’s worth. I cannot tell you how many times I would lay down at night and Satan would begin buffeting my mind… “You’ve done this to yourself, You’re a failure, You’re about to lose it all…” And I would pray, saying “Peace, be still.” And just as Christ calmed the waves in Mark 4:39; and there was a great calm, there was one in me! And I would drift off to sleep. Sweet! When Isaiah 40:31 says “They that wait” it does not mean “they that sit idle”, it means waiting as in a server would wait on a table. So rather than looking at myself as unemployed I began looking at myself as “unencumbered!” Hallelujah, now I have time to serve! It was all a part of the plan. 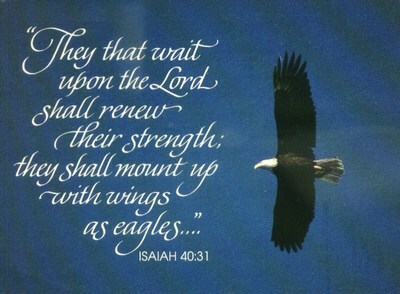 “The Lord shall renew their strength.” Renewed strength came from the Word of God. I could have slept in, but if I truly believed this was a time of unencumbered-ment it was meant to be a time of preparation for the next part of the journey. So I continued getting up at 4:30 a.m. and studied the Word of God to renew my strength, to restore it to the days when I felt my life had purpose. (Remember, I said there were dark days when I felt no purpose for Christ) And day after day my heart would leap for joy when I would discover the plan. Belief shows action. I had to put legs on those prayers and plans. Isaiah said “They shall run, and not be weary; and they shall walk, and not faint.” Days of discouragement came, some days I would run from something, other days I would run to something. When I walked it was a time of reflection, to slow down and see what God would have me learn in that place. I practiced those lessons for one year. I don’t know if you understand how unemployment works, but they only allow about a year of it, and mine was coming to a close. So I said to myself, “Lesson 1 Shari, Trust God.” It was sometimes weak, but it was there. God said if I had a mustard seed of faith (Matthew 17:20). And I am pretty sure mine was the smallest of the mustard seeds, BUT IT WAS THERE!!! God is never late, but this time, His right on time was right down to the wire. On Monday morning I filed my last unemployment claim at 6 a.m. – At 10 a.m. I had a job interview! Insert big cheesy grin here. If you are in the battle, have faith, keep serving, listen for His guidance, believe it and tell yourself and everyone you do… and then wait for it! It will be worth it all Amen!!! I don’t know how the food is at your house, but my refrigerator and cabinets seem to go from spanking new to spoiled overnight. I plan my next meal around a delectable piece of fruit only to discover that sometime between breakfast and dinner it has turned brown and shriveled up and is now ready for the nectarine nursing home. A half eaten loaf of bread is dry and stale, leftover casseroles are now penicillin want-a-be’s and I see dollar signs sitting where my culinary dreams once were. It reminds me of the shelf life of the Christian. Travel around much and in every church you see Christians from one extreme to the other regardless of how long they’ve been a member. Just this past weekend I met a saint of God who was as fresh off the vine as a Florida peach, and she had served God for decades. She was exciting and it was refreshing to witness God working in her life. So when I hear a child of God say “I’ve done my time,” as if serving God was a sentence and they’d now been released from the penitentiary pew I want to light a fire under them. Literally. I don’t believe there is an acceptable age to be a shelf sitter. Age does not define your ministry, God defines it and transforms it as He alone sees fit. Why is it that people put themselves on a shelf and just sit waiting for God to clean out the pantry? I’ve seen shelf sitters from the ages of nine to ninety satisfied with the status quo and unconcerned about the state if the church, and then (as was the case this past weekend) I’ve seen those who are serving till the trumpet blows! Life lessons are invaluable! Why would you dare to think that God can no longer use you when you reach the age of retirement? Or that younger people don’t have the desire to be in your presence. It’s then that you have walked the miles and have the experience to guide others safely through and your wisdom it far greater than what they’ll receive from the world. For those who are “too busy making a living” that you have no time to serve, you’re denying yourself the opportunity to live! I’ve seriously watched you rush into a service and collapse in your seat, roll your eyes because the service has taken on its own life, being guided by the Holy Spirit, rather than dictated by a bulletin, and lift your wrist at precisely twelve noon only to discover the Pastor hasn’t even gotten to the conclusion. You pray the alter call does not last too long and then rush out the door so you’ll perhaps get an early jump on the work week. And then as your chest palpitates you pray to God it’s not a heart attack; when in reality it was probably the Holy Spirit galloping to keep up with you. You pray for peace, but never slow down to allow its presence to enter into your life. And one of Satan’s greatest lies to the youth, “Do it later, you have so much time ahead.” Having lost a brother to an automobile accident at nineteen, I’m fully well aware that we’re not promised another second of time. 16 And he spake a parable unto them, saying, The ground of a certain rich man brought forth plentifully: 17 And he thought within himself, saying, What shall I do, because I have no room where to bestow my fruits? 18 And he said, This will I do: I will pull down my barns, and build greater; and there will I bestow all my fruits and my goods. 19 And I will say to my soul, Soul, thou hast much goods laid up for many years; take thine ease, eat, drink, and be merry. 20 But God said unto him, Thou fool, this night thy soul shall be required of thee: then whose shall those things be, which thou hast provided? 21 So is he that layeth up treasure for himself, and is not rich toward God. A few things I’ve discovered about things sitting on the shelf too long. It rots and is good for nothing, it grows stale and tough as shoe leather, or it gets bugs in it. The same is true in Christianity. A Christian out of service sours, their tender spirit hardens and they allow unhealthy things to enter their life. Don’t waste a minute of this precious life God has given us! Serve Him well friends. I don’t know why it is that every time God pours His blessings out on me I’m surprised. But I just stand in awe!!! I never understood why it was that God would open doors for someone like me to share and encourage others, but He did. I feel like braggin’ on my God this morning. I feel like praising His name and weeping tears of great joy. I feel like there is someone out there reading this blog today that needs to hear about Jehovah God, our Provider, Who is never late but is often right down to the wire on time! I cannot tell you the times that I have shown up for the day dressed in drab, prepared for the funeral and God said put on your coat of many colors girl, I had purpose in your problems!!! I began to think about those that God brought out of a trial only to make them greater than they could have ever imagined. I want to name a few and remind you of their journey to triumph that began with trouble. Abraham had already had to send his son Ishmael away, he loved Sarah and Isaac, but the pain he must have felt as he watched Hagar and Ishmael walk away into the wilderness would have overshadowed any joy in that moment. And then came new news, “You must sacrifice your only son Isaac.” How will he tell Sarah, how we he look into the face of his only child as he binds him and lays him on the wood? Isaac knew the ritual, what fear must have gone through his young mind and heartbreak that his father would allow it; and then… the bleating of a lamb in the thickets… Can you feel the pressure as it lifts from Abraham’s heart. “Jehovah!” Whew! No funeral here! As a young man Joseph feels God on his life, he’s dreamed dreams and perhaps he told them with a little more pride than he should have, but he knew in his heart they were of God. He’d grown up experiencing the favor of his earthly father and the jealousy of his siblings but never in a million years did he dream his brothers would betray him and hurt their farther in such a manner. But they did. Held captive by Pharaoh, imprisoned for crimes he did not commit and still in the pit of his soul he knew God had a plan, but it sure was rough hanging onto that hope in the damp darkness of the night. But favor came again. And he rose up into power and position and with godly wisdom saved his people from certain famine and death. It had to have been bitter sweet when he stood before his brothers and said, “You meant it for evil but God used it for his glory.” The heartache washed away with the tears as he finally understood God’s plan. No funerals here!! Lazarus’s sisters sobbed with heartbreak at the death of their brother. They’d cried out to the Lord to save him, they’d believed in faith that He would. Healing never came but the funeral day did. As Jesus arrived they may have felt both joy and sorrow; failing to understand how their faith had not been enough. Seeing Christ weep would again bring a flood of emotion in the sisters, “But He’s God; if God cries it can’t be good!” And then He speaks “Lazarus, come forth.” No funeral here either!!! God’s purpose in problems was sometimes a nail biting, pit in your stomach, ready to throw up experience. But when the plan is finally unveiled there are tears of joy and jubilation. Your problems have purpose. Keep holding on and waiting for Christ to come on the scene and say “Dry your eyes child… and watch!” I can say that from the other side of many journeys in the faith. Hold on!!! !